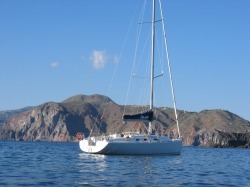 the first true low cost yacht charter company in Spain. We guarantee the cheapest daily, weekly and weekend rental rates for a 40 foot Racer/Cruiser Yacht in Barcelona. Carpe Vitam is based in the Puerto Olimpico of Barcelona, only a 15 minutes drive from the international airport. 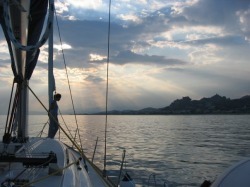 From here, you can easily start your own individual sailing adventure to the stunning locations of the Mediterranean. Take the yacht out for a fun or relaxing day with friends or family, explore the scenic beauties of the Costa Brava and surroundings on a weekend trip or even leave for a week or two to experience an unforgettable journey to the captivating Mediterranean islands. The yacht comprises a salon, two lavatories and 3 cabins with beds which comfortably accommodate up to 8 people. For a day cruise she even fits up to 12 people.